Odoo Based complete Ecommerce platform integrated with Malaysia Marketplace | Instant-ERP: An online/offline model for Employee Leave Apps suitable for Malaysia SME with unstable internet connection. it can use the ir.model.fields as a field object during development which able to detect the field size , field type ,etc. A simple proof of concept apps is as follow , please feel free to comments so that i can improve it , thanks. 1. Set up the Leave Type at OpenERP. 2. At the Instant-Payroll interface, synchronize the Leave Type data from OpenERP. 3. Set up the leave details at Instant-Payroll (e.g. leave grouping). 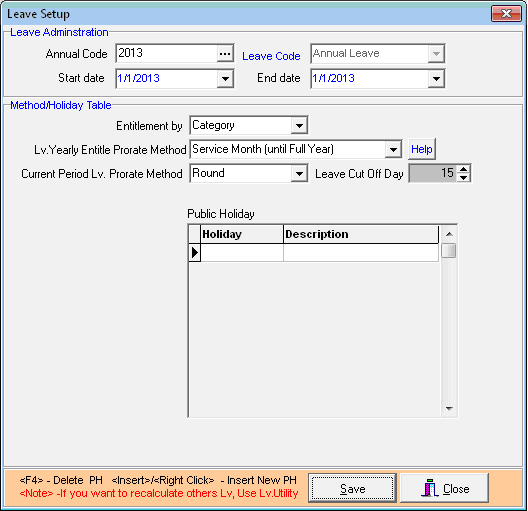 Allocate the number of leave days for each leave type. - Leave the Leave Setup , do not have to configure for the moment , as this is only a Proof Of Concept . - And the Leave allocation is the place where you can configure to actually effect the Employee's entitlement for ANNU , ANNUAL leave only at this moment and for NONE category. As my Proof Of Concept employee is 0671 (openerp user is administrator) , with department "NONE" and service year around 8 year 1 month , so it should be on the 1st row and if you change the entitlement column to any day , it will then sync back to openerp . 4. Process to generate leave entitlement for all the employee records. (Currently the “Process” is still pending, so temporarily need to manually update the Employee Entitlement for each records. There is already an employee record with entitlement updated, user code: 0761) , it will be a automatic process which will generate all employee leave entitlement records. 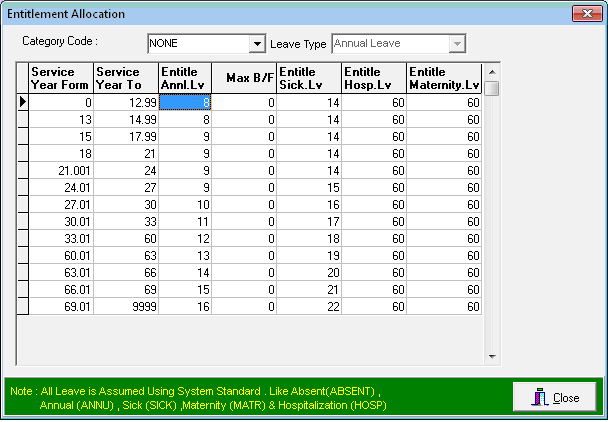 The record for Proof Of Concept can only be generated from the Employee Leave entitle form , select employee 0671 and then select leave code "ANNU" , it will generate and calculate the leave entitle. 5. Synchronize the leave entitlement to OpenERP. what it does is that , whatever we generate from the payroll leave locally , it will be sync back to openERP. 6. 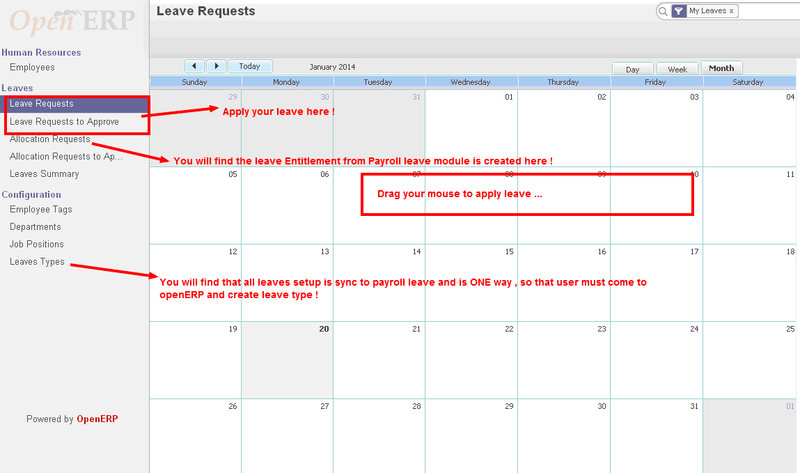 Execute the leave transactions (apply leaves, approve/disapprove leaves) at OpenERP. 7. Synchronize the leave result from OpenERP to Instant-Payroll. 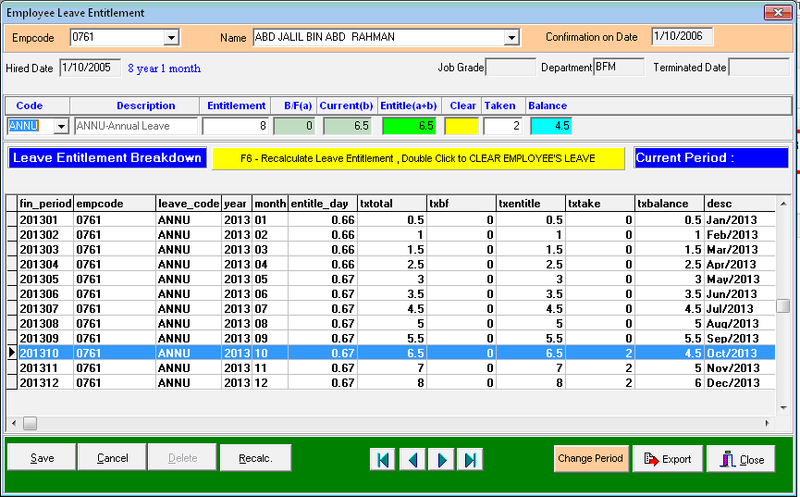 once we have sync form OE the leave record , it will show in the entitlement screen. So that is all and hope this can be useful to my Malaysia SME clients , so that they can opt for offline if they want or somehow , some clients are concerns for security , then they can keep an offline DB at their site as well ! And for the rest of the communities from OpenERP ,do drop me a notes or in the forum let me know your answers or comments.